GOWER, Mo. (CNS) — Tucked away off a rocky road in Gower in rural Missouri, a small community of cloistered nuns has just come out with a new Christmas album. Their music, which started as private prayer, has become a musical balm for a weary world in search of peace. Their sweet harmonies are the fruit of their faith and they have chosen to share it with the world. Chances are that this new album, “Caroling at Ephesus,” will be a hit. Though the sisters live quietly in near obscurity — their singing is well-known. Four of their previous albums have topped the music charts. When they sing, people love to listen. The Benedictines of Mary, Queen of Apostles at the Priory of Our Lady of Ephesus range in age from 18 to 92. They have chosen to leave the world and spend their days working in silence — except for when they are singing sacred music. While many consumers crave simpler holidays, these women, young and old, have made an art of simplifying holidays and keeping them holy. The sisters are drawn to a divine rhythm — which to the outside and commercial world may seem out of rhythm. They have left their families to follow Jesus. The community has grown to 31 sisters and draws women from all over the world, including Germany, Netherlands and Kenya. One member is an Algerian-Canadian, and there also women from Texas, South Dakota and Wisconsin. The nuns milk cows, gather eggs, make vestments and nurture the souls of weary priests. One of their specialties is making church vestments by hand. When they kick the straw off of their boots and go into the chapel, they align their hearts and voices — and create harmony. They sound like angels as their voices echo off the walls. “We work in silence; it’s a full silence, we are waiting there for something very beautiful to come. The voice of our Lord, comes to us in whispers, so we have to be quiet so we can hear it,” Mother Cecelia said. On Christmas Eve, in the still of the night, they will gather by the Christmas tree for a little ceremony before midnight Mass, with Sister Emmanuel uncovering a baby Jesus figurine to be laid at the foot of the tree. They will sing “O Come, O Come Emmanuel” one last time. At midnight, the women will process into their tiny chapel, singing, “O Come Divine Messiah,” and the youngest woman in the growing community will place the baby Jesus in the waiting manger in the creche. The nuns spend the 12 days of Christmas enjoying one another’s company. With a little extra recreation and time together, they often spend the days singing Christmas carols around the fire. They draw one another’s names at the beginning of Advent. The sisters are not allowed to own anything and they do not exchange much in the way of material gifts. They exchange spiritual gifts instead, praying in a special way for the sister whose name they chose. “It really enhances the celebration of Christmas because we are reminded that true Christian charity is not a matter of gifts, but of love, and helping each other get to heaven behind the lead of the Christ Child,” the sister explains. The sisters chant in Latin every day. When it came time to choose carols for their new album, they looked for music that expressed devotion to the Christ Child most beautifully, according to Sister Scholastica. The sisters are in the process of raising money to build their priory church and they thought a Christmas CD would be fitting. 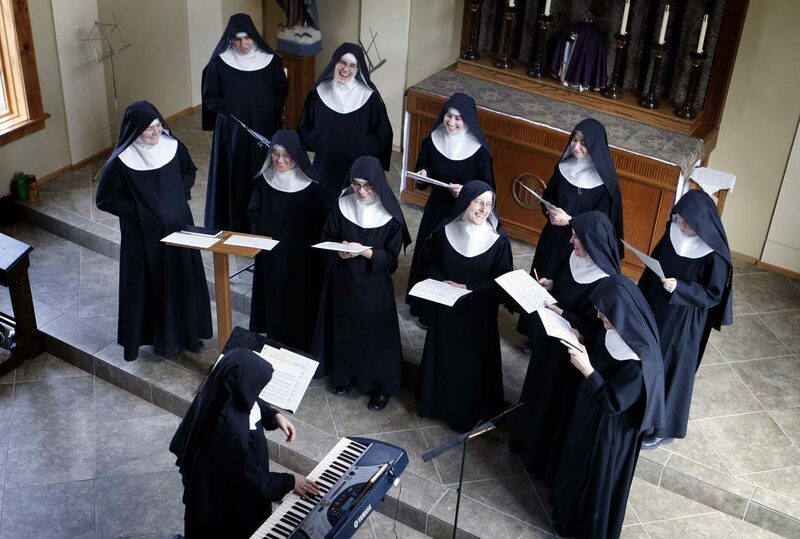 Editor’s Note: More information about the album and a video of the Benedictine nuns singing can be found at https://music.benedictinesofmary.org/node/73. I would love to order your beautiful music/chants. How do I do that.